This book reflects Marc Thompson’s twenty years of experience designing and teaching analog circuit design. He describes intuitive and “back of the envelope” techniques for designing and analyzing analog circuits, including transistor amplifiers (CMOS and bipolar), transistor switching, thermal circuit design, magnetic circuit design, control systems, and the like. The application of some simple rules-of-thumb and design techniques is the first step in developing an intuitive understanding of the behavior of complex electrical systems. 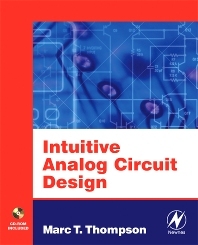 This book outlines some ways of thinking about analog circuits and systems that hopefully develops such “circuit intuition” and a “feel” for what a good, working analog circuit design should be. *Introduces analog circuit design with a minimum of mathematics. *Gives readers an intuitive "feel" for analog circuit operation and rules-of-thumb for their design. *Uses numerous analogies from digital design to help readers whose main background is in digital make the transition to analog design. *Accompanying CD-ROM contains PowerPoint presentations for each chapter and MATLAB files used in the text. Introduction and motivation; Signal processing basics: Review of Bode plots, Review of pole-zero plots,Second-order systems,Relationship between bandwidth and risetime; Review of bipolar device physics: Intrinsic semiconductor, Electrons and holes, Drift and diffusion, Doping and its effect on carrier concentrations; Bipolar device models: Diode large-signal model, Diode small signal model, Transistor large-signal model, Transistor small-signal model, Transistor charge storage; Review of feedback systems: Block diagrams, Routh stability criteria, Bode-plot method for determining stability of feedback systems, Compensation techniques, Design example --- Photodiode amplifier, Design example --- operational amplifier; Bipolar transistor amplifiers: Common-emitter amplifier, Bandwidth of common-emitter amplifier, Other building blocks; Bandwidth estimation techniques: Dominant poles, Method of open-circuit time constants, Method of short-circuit time constants, Design example --- high frequency amplifier, Design example --- high frequency gain of +5 amplifier with high current output; Transistor switching and switching speed estimation: Models, Charge-control model, Base-current driven switch, Voltage-driven switch, Emitter current switching, Design example --- semiconductor diode switching; Transistor extended models: Development of extended model, Other building blocks, Design example --- high gain amplifier; CMOS amplifiers: MOSFET,MOSFET large-signal model, MOSFET small-signal model; Advanced transistor amplifier design techniques:Bootstrapping, Current switching,Current mirrors; Operational amplifier topologies: Basic bipolar amplifier, Basic CMOS amplifier, Design example: bipolar operational amplifier; Operational amplifier limitations --- real-world op-amps: Gain, Voltage offset, Input current, Common-mode rejection ratio (CMRR), Power supply rejection ratio (PSRR, Output impedance, Frequency response; Operational amplifier circuit potpourri: Standard topologies, Differential amplifier, Sallen-Key circuit; Current-feedback op-amps; Analog filtering: Topologies, Implementation methods, Lowpass to bandpass and lowpass to highpass transformations, Design example --- 1 MHz lowpass video filter, Design example --- 2 MHz bandwidth, 3.58 MHz centered bandpass filter; PC board layout, hints and rules-of-thumb: Basics of grounding, Impedance of a PC board trace, Power supply bypassing; Passive components --- real world issues: Resistors, Capacitors,Inductors; Use of circuit analogies: Mechanical circuit analogies, Thermal circuits, Magnetic circuits; Other random useful design techniques: Middlebrook's extra element theorem, Cramer's rule. Thompson Consulting, Inc. MA, USA. Worcester Polytechnic Institute, MA, USA.